//A personal NK favorite among the top EDC defense folders, the Matriarch 2 is a beautiful & deadly design. 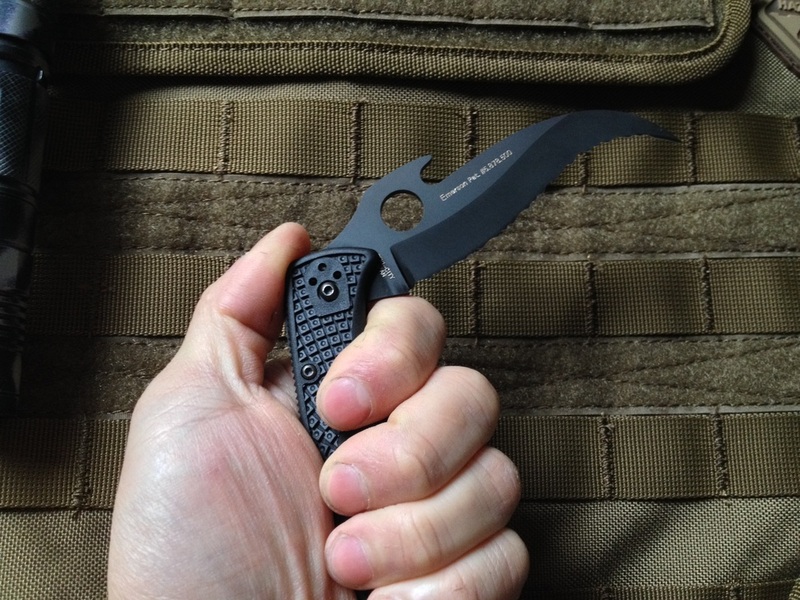 Many elements come together to make the knife a favorable realistic carry option whether it be for rescue or combat, the features of the Matriarch 2 satisfy the requirements to perform admirably & be reliable. //A massive 3.5 inch serrated blade is designed for speed cutting. Not the best for the variety we encounter in normal EDC but that will depend on the user's job and skill with sharpening serrations. Thankfully the VG10 steel easily strops back to a razor edge and with the chisel style grind a user doesn't have to struggle getting a clean edge. In many ways this knife is the most close to a perfect Emerson. The knife waves open and is tapped for any pocket carry position, has a safety so if the blade unlocks or fails to lock the user's hand won't be seriously injured, the blade is a chisel grind like on Emersons, & the focus is on tactical use. There's nothing else quite like this knife on the market but it's real value lies in the effective cuts it can make when holding the knife in a standard hammer grip. This is most common for normal civilians and people not trained with a knife. //Though it's based on the back lock platform that the Endura & Delica come from, the overall tactical focus comes together in a one of a kind package that is admirable. 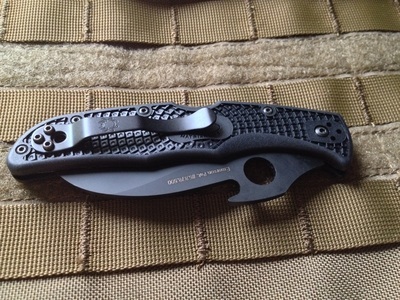 Yes the back lock is not the strongest even though the Delica & Endura models are widely popular, but the Matriarch 2 features a unique blade shape that is designed for slashing only so techniques that would close the blade are not utilized. The knife also has the weight, carry versatility & deployment versatility to make it a very effective civilian EDC folding defensive knife. A user should still take precaution and train for the possible unlocking of the knife especially in real combat situations that involve environmental obstructions & hard surfaces such as granite counter tops, walls, wooden fixtures, tables etc. A user should also train for deployment under stress and high intensity situations with lots of body movement. 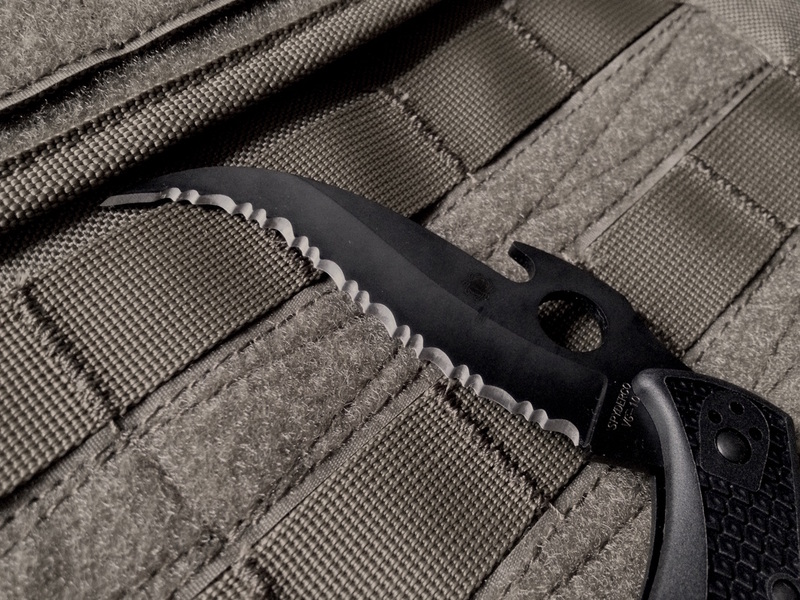 Though limited by it's other design focus of being light weight/convenient, the Matriarch 2 provides a deadly/effective option that meets all the requirements for a satisfactory defense/emergency EDC blade. 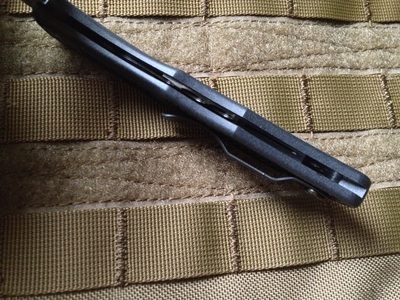 Highly recommended and voted "best tactical folder for 2015" by NK. Another option very similar is the Cold Steel Black Talon 2 which has a stronger locking mechanism but lacks the serrated edge of Spyderco. Ultimately which will be based on preference, feel, weight, materials style, opening method. //The extra thin profile of the handle means the blade can rub against the inside of the FRN when using the thumb hole to open. A buyer should be aware of this flaw but the effect is purely cosmetic scratching on the blade finish. Hardware durability is top notch coming from Seki City, Japan, so no issues with disassembling the knife for maintenance. Inside the FRN handle are inset/ nestled steel liners that have been drilled to be lighter. Both the blade & back locking bar are DLC coated which is the best option in the market for coating. Knife comes razor sharp and the blade is a chisel grind. The steel is VG10 so is tough and more likely to roll than chip so stropping is functional and easy for maintaining the edge. Some people complain there isn't jimping on the top of the blade for the thumb but I believe there are two reasons for this. Firstly it's not necessary because the Matriarch is only capable of slashing/draw cuts, second plausible reason is balancing costs of making such a complex blade by not doing jimping. //The knife is a light weight folder designed for tactical use but tactical can mean different things. For rescue or emergency cutting the knife is second to none & comes highly recommended. For a self defense application which was the original intent, the knife has all the features to make for a "safe to use in a fight" folder but the reality should still be realized that this is a compromise on strength & durability in exchange for concealablity. Immediately when picking up the knife one can feel the lightweight construction, realize the tip limitations & the hardware strength. A fair conclusion is a person needs to be aware of the fact that the knife was also designed to be convenient and easy to carry. Another factor is the design of the blade can feel limiting. Again the purpose of the blade design was to help normal wild slashing techniques be more deadly but this does create a feeling of limitation. The knife doesn't have much negative angle so you quickly learn in use that it's only the final hook shape near the tip that is being utilized.